Somayeh Mehri (29) and Rana Afghanipour (3) are a mother and daughter living in Bam, southern Iran. 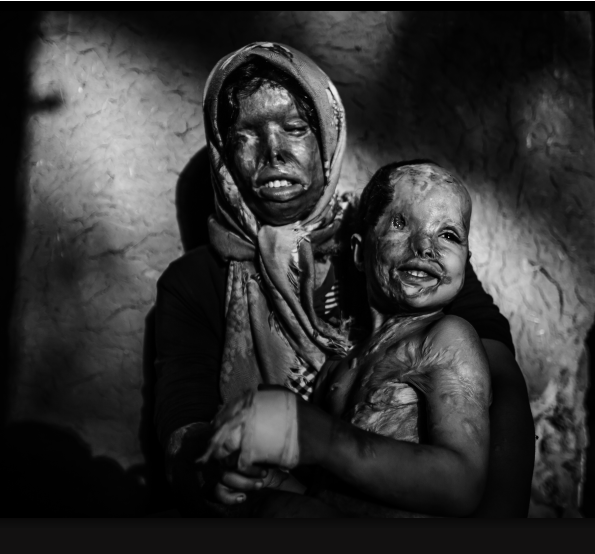 They were attacked with acid by Somayeh’s husband Amir. Somayeh Mehri (29) and her daughter Rana Afghanipour (3) give each other a kiss. Since their disfigurement in an acid attack, they say, others don’t like to kiss them. Somayeh had frequently been beaten and locked up by her husband, and finally found the courage to ask for a divorce. Amir warned her that if she persisted in her attempts to leave him, she would not live out life with the face she had. One night in June 2011, he poured acid on Somayeh and Rana as they slept. 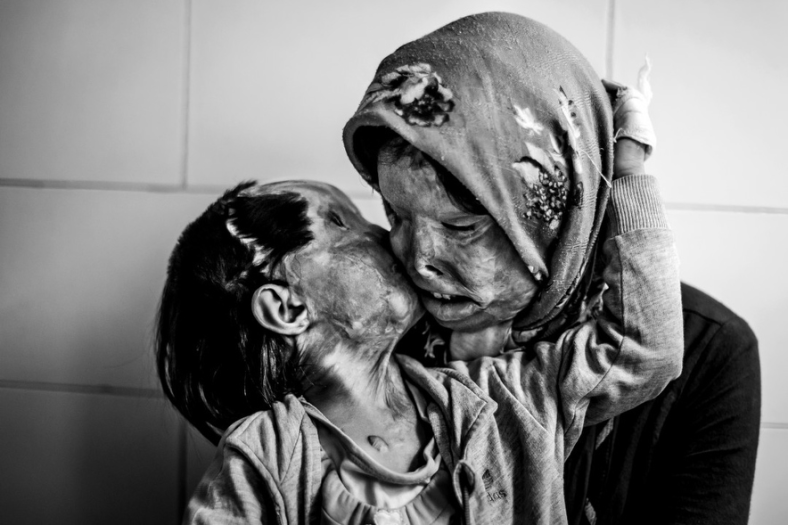 Somayeh’s and Rana’s faces, hands, and, in places, their bodies were severely burned. Somayeh was blinded, and Rana lost one of her eyes. I have run into Muslim families where the husband was very kind to his wife and children. We need to remember that not all Muslim husbands/fathers are so cruel, and that there are many husbands/fathers who are this cruel in every group of people. What this man did to his wife and daughter deserves life imprisonment, if not a death sentence (something that is very controversial even in my mind). Did he get that? Women have been the target of extreme cruelty for too many millennia. This is what? Have nothing to say, feeling so remorseful and what have they to go through. God bless them and take care of them. What a picture. Their love shines through, and it’s beautiful despite everything.